Do You Remember... "Colt .45"
There was a man among the best. The fastest gun or man alive. “Colt .45” was created in a hurry by Warner Bros. after a call from ABC revealed a national sponsor wanted a TV show. 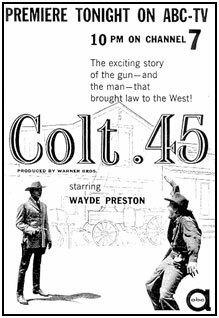 In its three seasons on the air “Colt .45” was a mixture of uncertain sponsorship, many repeat episodes, and an abrupt change in the starring role after a walkout by—or firing of—the original star, Wayde Preston. Additionally, Warner Bros. couldn’t decide whether Preston should wear a mustache or not. Handsome, blond, curly-headed, 6' 4" William Erskine Strange was born 9/10/29, in Denver, CO, and grew up around Laramie, WY. Attending the University of Wyoming, he studied pharmacy. An accomplished musician, he played string bass with various jazz bands in the late ‘40s. Inducted into the military in ‘50 as First Lieutenant, he spent a year fighting in the Korean War. Following his discharge he was a Park Ranger at Grand Teton National Park and rode the Wyoming rodeo circuit. Also a licensed pilot, he was flying for TWA when he met actress Carol Ohmart whom he married in ‘56. Although the marriage only lasted two years, this introduced Wayde to showbiz. He was under contract to 20th Century-Fox for six months before he landed the role of Chris Colt on “Colt .45” which began its initial season on ABC Friday nights from 10-10:30pm ET on 10/18/57. Christopher Colt was a U.S. Government undercover agent posing as a gun salesman for the Colt Firearms Company. The series didn’t fare well opposite CBS’ “The Lineup” and “Friday Night Fights” on NBC. Hoping for better ratings, ABC moved “Colt” up to 8:30-9 Fridays in late Jan. ‘58, only now it was up against “Zane Grey Theatre” on CBS and “Life of Riley” on NBC. A total of 26 episodes were aired in the first season before the sponsor dropped out and ABC canceled the show in mid-April ‘58. In TV GUIDE (6/28-7/4, ‘58) Preston blamed a low budget and lack of promotion compared to other WB shows for “Colt”’s failure. 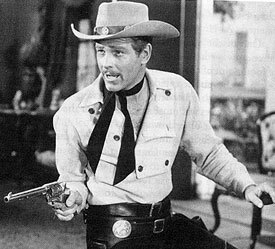 Off the air for 6 months, Warner Bros. began airing first season reruns in October ‘58 from 9-9:30pm ET on Sundays following “Maverick” and the debut of “Lawman”, a full night of Warner westerns, but “Colt” did little to combat “Dinah Shore” in color on NBC and “GE Theatre” on CBS. Without fanfare, new “Colt” episodes debuted on 4/5/59, in that same time slot. Wayde now sported a mustache. Thirteen new episodes aired from April through 6/28/59, before reruns (sans mustache) began again in July, still in the 9-9:30 Sunday timeslot through the end of September ‘59. On 10/4/59, “The Rebel” with Nick Adams took over Preston’s timeslot with “Colt .45” moving to 7-7:30 ET Sunday night before “Maverick” and “Lawman” instead of after. Now Wayde faced off against the established “Lassie” on CBS and the new “Riverboat” on NBC. In addition to moving “Colt .45” all over the schedule, WB couldn’t decide whether Preston should or shouldn’t wear a mustache. As the third season began in October ‘59 the mustache was again gone and “Colt” was back on Sunday night from 7-7:30…at least for awhile. 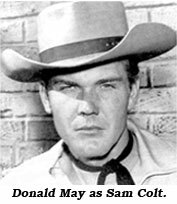 In mid-March ‘60, “Colt” was moved to Tuesday night from 9:30-10. long about this time, Wayde exited the series, although already-in-the-can episodes continued to be shown alternating with all new Donald May as Sam Colt Jr. (Chris Colt’s cousin) episodes. May actually stepped in as Sam Colt with the 12/6/59, episode (“Alias Mr. Howard”). On Tuesday nights, even with “Sugarfoot”/“Bronco”, “Wyatt Earp” and “Rifleman” lead-ins, all the timeslot/mustache/cast changes had pretty well doomed “Colt .45”. Additionally, it was now battling for ratings opposite “Arthur Murray” in color on NBC and “Red Skelton” on CBS. After 6/21/60, “Colt” was back to those reruns until September ‘60 when “Stagecoach West” replaced Colt. As to Wayde’s dismissal from Warners, Wayde told attendees of the Charlotte Western Film Fair in ‘86, “We made the (half-hour) episodes in three days.” Always the low-western on the Warner lot, Wayde commented snidely, “I used to go to the pay window every Friday for my weekly insult. I asked for a 12 hour working day and a little more money. They told me I was crazy. I said if I’m crazy, I better walk out of here and that’s what happened.” The real reasons behind Wayde’s departure vary. In the book WARNER BROS. TELEVISION (‘85 McFarland) Bill Orr, head of WB’s television department, attributes Wayde’s leaving to a dispute over who would do a stunt—Wayde or a stuntman. Interesting to note, when “Colt” returned to the schedule in October ‘58, Warners, attempting to promote their embattled series, used Wayde as Chris Colt as a guest star four times on their popular “Sugarfoot” series with Will Hutchins. 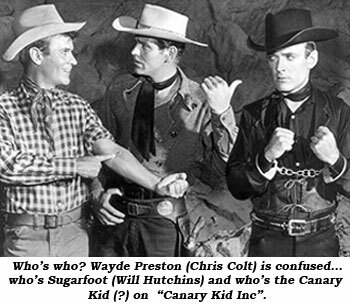 In “Canary Kid” (11/11/58), upon learning Colt is a lawman, Sugarfoot quips, “I always thought that fella was a gun salesman.” As Chris Colt Wayde co-stars with Will in “Return of the Canary Kid” (2/3/59), “Trial of the Canary Kid” (9/15/59) and “Canary Kid Inc.” (11/10/59). 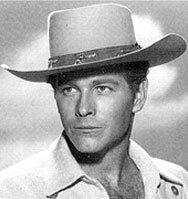 WB also cast Wayde as Waco Williams on “Maverick: Saga of Waco Williams” (2/15/59). But the oddest of all was Wayde’s “non-cameo” on “Maverick” after his departure from Warners. In “Hadley’s Hunters” (9/25/60) as Jack (Bart Maverick) Kelly seeks to clear himself of a trumped-up charge, he encounters John Russell and Peter Brown of “Lawman”, Will Hutchins of “Sugarfoot”, Clint Walker of “Cheyenne”, Ty Hardin of “Bronco”, even Edd Byrnes of “77 Sunset Strip”—then, shaking his head in a note of sadness, Kelly encounters Colt’s guns hanging on a rack. A definite inside joke! Wayde appeared on a “Bonanza” in ‘63, but by ‘67 he was in Europe making movies, including seven westerns such as “A Man Called Gannon” with WB alumnus James Garner. Returning to the U.S., Preston had a cancerous growth on his right temple removed in the late ‘70s, made a few minor films but succumbed to colon cancer 2/6/92, in Lovelock, NV.